From some angles, it looks like the housing recovery has brought an urban resurgence: for instance, the most urban counties are growing faster now than during the housing bubble, and many dense cities are having a boom in apartment construction. However, the most recent data show that asking prices in urban neighborhoods are rising only slightly faster than in the suburbs, and the suburbs actually have higher population growth. The Trulia Price Monitor and the Trulia Rent Monitor are the earliest leading indicators of how asking prices and rents are trending nationally and locally. 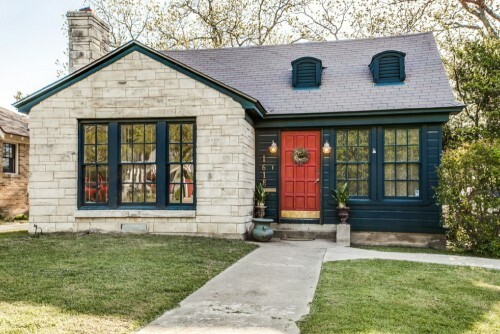 They adjust for the changing mix of listed homes and therefore show what’s really happening to asking prices and rents. Because asking prices lead sales prices by approximately two or more months, the Monitors reveal trends before other price indexes do. With that, here’s the scoop on where prices and rents are headed (see note #1 below). Despite declining investor purchases and more inventory coming onto the market, asking home prices continued to rise at the start of the spring housing season. Month-over-month, asking prices rose 1.2% nationally in March 2014, seasonally adjusted. Quarter-over-quarter, asking prices rose 2.9% in March 2014, seasonally adjusted, reflecting three straight months of solid month-over-month gains. Year-over-year, asking prices are up 10% nationally and up in 97 of the 100 largest metros. Albany, NY, Hartford, CT, and New Haven, CT, are the only three large metros where prices fell year-over-year, albeit slightly. *Data from previous months are revised each month, so data being reported now for previous months might differ from previously reported data. The Trulia Price Monitor and the leading sales-price indexes report price changes for the nation and for many large metro areas (For asking home price changes in 100 largest metros, click here: Excel or PDF). However, metros include both cities and their suburbs, and urban and suburban areas often have very different housing markets. The construction boom in single-family homes during the housing bubble was centered in the suburbs, and the subsequent bust was particularly painful in many of those same suburban areas. Many have wondered whether the housing bust has sparked a new preference for urban living in dense, walkable neighborhoods over sprawling, car-dependent suburbs. To compare how urban and suburban neighborhoods have fared in the housing recovery, we look at two measures: (1) price gains, based on the change in median price per square foot among all non-foreclosure homes for sale on Trulia, and (2) household growth, based on the U.S. Postal Service’s count of addresses receiving mail in each ZIP code. Both measures are year-over-year, comparing March 2013 with March 2014. We classify urban and suburban neighborhoods based on the kind of housing they have – urban neighborhoods are those where a majority of housing units are condos, apartments, and townhouses, while suburbs are those where a majority of housing units are detached, single-family homes – which we think is more meaningful than using big-city political boundaries (see note #2 below). Therefore, by “cities” we mean dense, urban neighborhoods. We also define “high-rise” neighborhoods as urban neighborhoods where a majority of housing units are in buildings with 50 or more units. Nationally, the change in median price per square foot was a bit higher in urban neighborhoods (9.8%) than in suburban neighborhoods (9.4%). Household growth, conversely, was higher in suburban neighborhoods (1.1%) than in urban neighborhoods (0.9%) over the past year. Locations with stronger demand should have both higher price growth and more population growth, so how can prices be rising faster in cities while population is growing faster in suburbs? Because supply matters, too. Suburbs can have faster household growth but smaller price gains because it’s easier to build new housing in suburbs than in dense urban neighborhoods, and new construction accommodates population growth while taking pressure off rising prices. 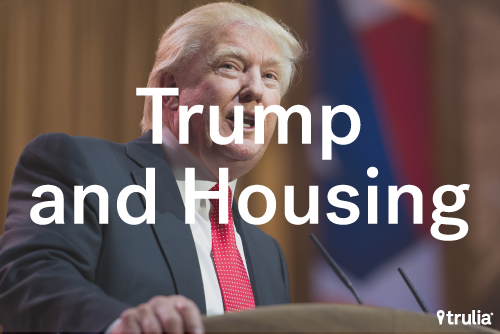 Note: among neighborhoods in the 100 largest metro areas. In high-rise neighborhoods, home prices rose 11.4% year-over-year, faster than urban neighborhoods overall and faster than suburban neighborhoods. These hyper-urban neighborhoods – which include much of Manhattan, Chicago’s Loop, and downtown Boston and downtown San Francisco – are highly visible but, in fact, make up a very small share of urban neighborhoods. Most urban neighborhoods look more like Brooklyn than Manhattan, or more like San Francisco’s Inner Richmond than the Financial District. The construction recovery has been disproportionately urban. In 2013, apartment building construction hit a 15-year high, even though single-family home construction is still considerably below normal levels. That means many dense cities where much of the housing stock is comprised of rental apartments, including New York, Boston, and San Francisco, have been having a construction boom relative to their local normal level of construction. Population growth in urban areas has rebounded in recent years after falling during the housing boom. Census population estimates show that the most urban counties – which we define as those in the top quartile by household density (that is, most households per square mile of land area; see note #3 below) – grew by 0.8% between 2012 and 2013, after growing less than 0.2% in the boom years of 2003-2006. Still, this top quartile of highest-density counties – which includes all five New York City boroughs, San Francisco, the District of Columbia, Los Angeles, and others – grew more slowly than the second-most dense quartile of counties, which includes suburban counties of large metros as well as the main counties of smaller, lower-density metros, such as Rockland County, NY, and Contra Costa and Riverside counties in California (see chart). To sum up: although home prices and population are growing fastest in hyper-urban high-rise neighborhoods, asking prices are rising only slightly faster in urban neighborhoods as a whole than in suburban neighborhoods. Furthermore, population is growing faster in the suburbs than urban neighborhoods overall, despite the fast growth in high-rise neighborhoods. The densest counties don’t have the fastest growing population, but they’re growing a lot faster than they did during the housing boom, when lower-density counties grew considerably faster. 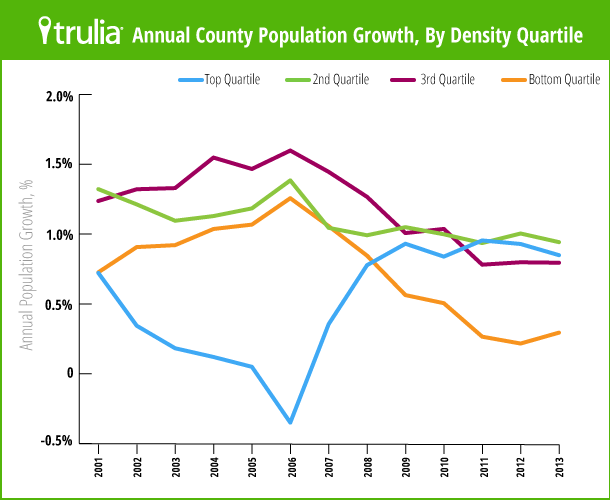 Population growth since the housing bust has slowed most in the bottom quartile of counties, which are largely rural areas, not suburbs. The suburbs are far from over. In March, rents rose 3.9% year-over-year nationally. Rent increases were higher for apartments (4.4% year-over-year) than for single-family homes (1.9% year-over-year). The most expensive rental markets remain the San Francisco and New York metros, where median rent for 2-bedroom units are $3,350 and $3,300, respectively. Rents rose in 24 of the 25 largest rental markets: the Washington DC area was the only metro where rents fell year-over-year. To download the list of rent changes for the largest metros: Excel or PDF. All numbers are rounded to one decimal place, so the final column might not equal the difference between the two columns to the left. 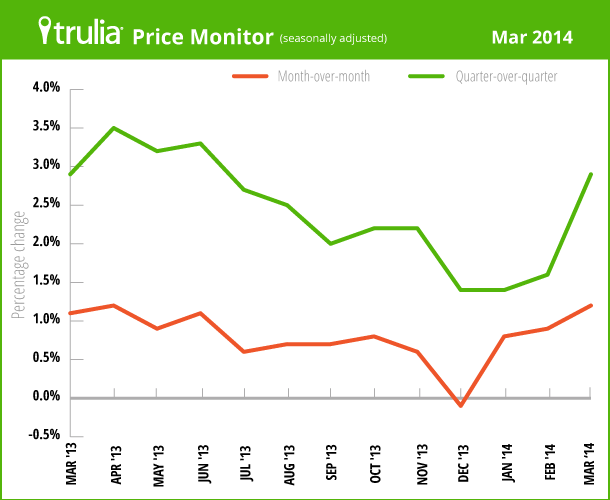 The next Trulia Price Monitor and Trulia Rent Monitor will be released on Thursday, May 8. Note #1: How did we put this report together? To recap the methodology, the Trulia Price Monitor and the Trulia Rent Monitor track asking home prices and rents on a monthly basis, adjusting for the changing composition of listed homes, including foreclosures provided by RealtyTrac. The Trulia Price Monitor also accounts for the regular seasonal fluctuations in asking prices in order to reveal the underlying trend in prices. The Monitors can detect price movements at least three months before the major sales-price indexes do. Historical data are sometimes revised each month, and historical data in the current release are the best comparison with current data. Our FAQs provide all the technical details. Note #2: To compare “city” versus “suburb,” we classify neighborhoods as either urban or suburban based on how dense or spread out the housing is. Using Census data, we define urban neighborhoods as those where a majority of the housing is apartments, attached townhouses, or other multi-unit buildings; suburban neighborhoods are those where a majority of the housing is single-family detached houses. We used this methodology rather than simply identifying the biggest city in a metro as “urban” and treating the rest of the metro as the “suburbs,” as other reports on cities-versus-suburbs often do. The problem with using city boundaries is that many neighborhoods outside of the biggest city are actually much more urban than some neighborhoods within a city’s boundary. For instance, our definition classifies Hoboken, NJ, Central Square in Cambridge, MA, and Santa Monica – which are all very dense – as urban neighborhoods, even though they’re outside the city boundaries of New York, Boston, and Los Angeles, respectively. The top quartile includes counties with weighted density above 2000 households per square mile, such as New York City’s five boroughs , San Francisco, Suffolk (Boston), MA, Los Angeles, Cook (Chicago), IL, Westchester, NY, and Montgomery, MD. The second quartile includes counties with weighted density of 1000-2000 households per square mile, such as big-city suburban counties like Rockland, NY, and Contra Costa, CA, as well as counties containing lower-density cities like Maricopa (Phoenix), AZ, and Erie, PA. The third quartile includes counties with weighted density of 500-1000 households per square mile, such as Gwinnett (outside of Atlanta), GA, and Yakima, WA. The bottom quartile includes counties with weighted density below 500 households per square mile, including small-town and rural counties. This quartile includes 82% of counties, covering 27% of the U.S. population. 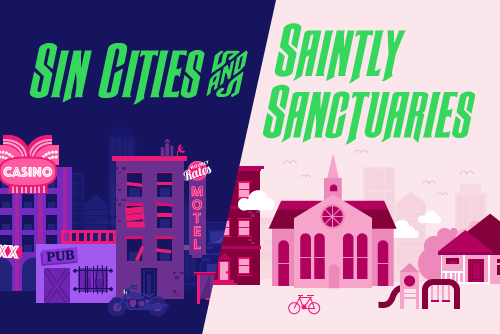 Mardi Gras is around the corner, we’ve found America’s most sinful – and saintly – cities. 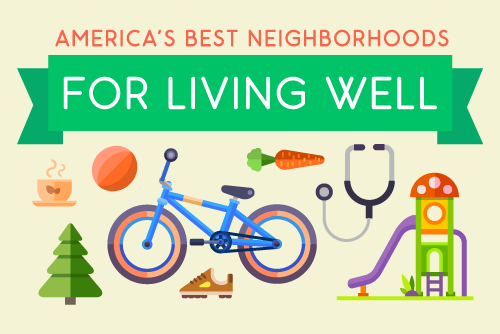 Today Trulia released the new Live Well maps to help home seekers to find the best places to live for staying active and healthy. Using data that power these maps, we've discovered that neighborhoods in Charlottesville, Va., San Francisco, and San Diego top the list for living a healthy lifestyle.